It’s Christmastime again, as we begin to prepare for the coming of the Prince of Peace who heralds the Reign of God. God’s plan for all creation is a beautiful one—a world of justice, peace, and love. Yet, how do we continue to witness to that dream in divisive, divided, and unsettling times? In this final issue of 2016, there are many stories of people living the Reign of God in the world today. Scarboro mis­sioner Fr. Ron MacDonell writes about his visit to the city of San Cristóbal de las Casas in Chiapas State, southern Mexico, where Indigenous women are empowered to change their lives and their communities. They once felt afraid and vulnerable, as Mary surely did on her journey to Bethlehem. Now they are women of hope and courage. You will also read articles by Krista Bowman and Our Lady’s Missionary Sr. Christine Gebel about refugee families in Canada. Their journey, like that of Mary and Joseph, is fraught with uncertainty and upheaval. Yet many people are coming together to make them feel welcome and at home. Anne-Marie Jackson, director of the Jesuit Forum for Social Faith and Justice, writes about her experience at the World Social Forum in Montreal this summer. She describes the event as “a graced gathering, people-centred, creative, full of energy and ideas. In this listening, sharing space, there is a feeling of hope and possibility, even up against the over­whelming challenges in our world.” Anne-Marie tells us about individuals who have come from all over the world to discuss shared issues and create movements for a sustainable, peaceful, just world. 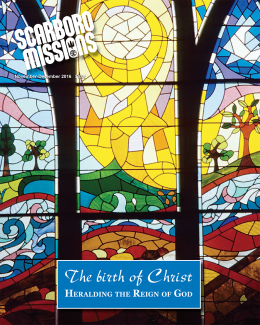 This resource would foster group dialogue in parishes, schools, and elsewhere in the community. The future of our planet is a concern for all. As we journey with the Holy Family this Christmas and celebrate Christ’s coming among us, may we hear again the call to witness to the Reign of God.